Criminal Drug Charges - PWID Alfonso Gambone of Gambone Law discusses - How much drugs do police need to find to charge me with Possession with Intent to Deliver? New Jersey has some of the nation’s toughest drug possession laws and it’s important to understand them because they are very different than its neighboring state of Pennsylvania. In New Jersey, the penalties for possession of a controlled substance differ based on the type of drug and the amount that a person possesses at the time of their arrest. Keep in mind that to be convicted of possession, the State must establish either actual or constructive possession of the controlled substance and I encourage you to read my article on this topic to understand it more. In New Jersey the possession of less than 50 grams of marijuana is a disorderly persons offense (non-indictable) under NJSA 2C:135-10a(4), the maximum penalty for this crime is 6 months in jail, $1,000.00 fine, loss of driver’s license, and drug rehabilitation. If a person is convicted of more than 50 grams of marijuana, it is an indictable, 4th degree criminal offense, which is punishable by up to 18 months in prison and a $15,000.00 fine. Find out about how Pennsylvania handles Marijuana offenses. A person who is charged with possession of any of these drugs (cocaine, heroin, methamphetamine, acid, ecstasy, or other stimulants, hallucinogens, opioids, and depressants), faces a maximum of 3-5 years in state prison (3rd degree), a $1,000.00 fine up to $25,000.00, loss of driver’s license, and a mandatory minimum drug education program. Unlike drug possession, an individual charged with possession of drug paraphernalia under NJSA 2C:36-2, faces a disorderly person’s charge with up to 6 months in prison, a minimum fine of $500.00-1,000.00, and a suspension of driver’s license of up to 2 years. A person charged with this offense faces the penalties of a 3rd degree indictable offense with a maximum penalty of up to 5 years in jail and fines. 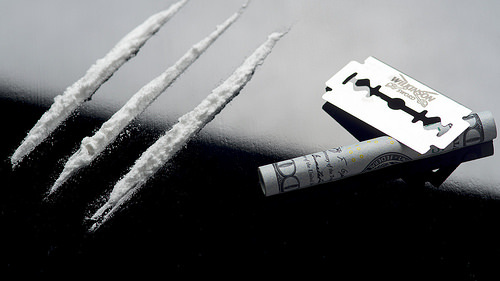 In New Jersey, a person faces stiffer penalties if he or she knowingly and purposely possesses a controlled substance (cocaine, heroin, LSD, meth), with the intent to distribute or sell it. It is a crime of the 1st degree if a person possesses 5 or more ounces of heroin or other controlled substances and carries with it a maximum 10-20 year state prison sentence with a minimum term of at least 1/3 or ½ of that sentence during which a person is ineligible for parole. There is also a maximum fine of up to $500,000.00. A person commits a crime of the 2nd degree for possession of a controlled substance if he or she sells or distributes less than 5 ounces but more than a ½ an ounce of that substance. This person faces a 2nd degree crime with a presumption of incarceration of up to 5-10 years in jail. Possession of a controlled substance with the intent to distribute or sell less than ½ an ounce of these illegal narcotics faces a crime of the 3rd degree and up to 5 years in state prison. Remember that you can be convicted of a possession or possession with intent to distribute charge even if you never had the actual drug on your person! If you have knowledge that the drug is present and it is proven that you had intent to exercise physical control over it then you are liable for this offense in New Jersey. This legal principle is also true in Pennsylvania. It is therefore very important not to place yourself in a situation where there is a substantial amount of drugs or other controlled substances in a house or car because there are cases where people are charged and even convicted of these offenses simply because they surrounded themselves with other persons who possessed, manufactured, or distributed controlled substances. A person who is charged with the intent to distribute or sell marijuana can be charged with a 1st, 2nd, 3rd, or 4th degree indictable offense depending on the quantity of the substance. It is a 4th degree offense in New Jersey if the quantity is less than 1 ounce, a 3rd degree offense if the quantity is more than 1 ounce but less than 5 pounds, a 2nd degree offense if it’s more than 5 pounds but less than 25 pounds, and a first degree offense if it’s more than 25 pounds. For more great criminal defense information in New Jersey and Pennsylvania, please keep reading our blog and take some time to visit our free download section.